How to draw Anime character Sailor Jupiter, Makoto Kino from Sailor Moon series. Sailor Jupiter is one of the five original Inner Sailor Senshi of the Solar System. Her civilian identity is Makoto Kino. Sailor Jupiter is the third member of the Senshi to be discovered by Usagi Tsukino, and serves as the “brawns” of the group. 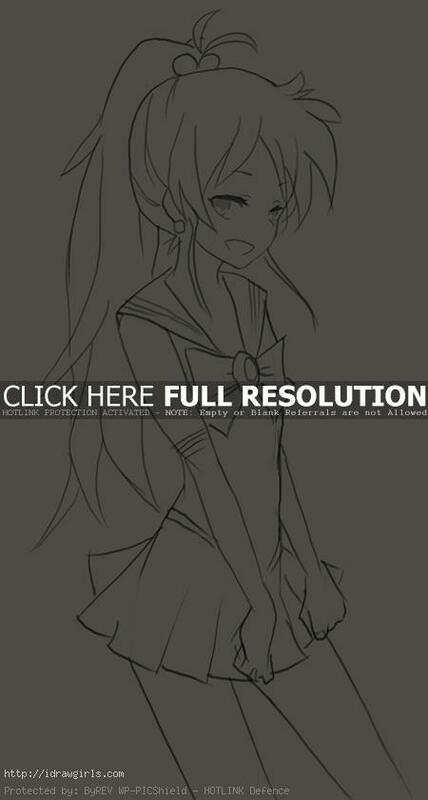 In this tutorial you will learn to draw a Manga character Sailor Jupiter. I will show you step by step drawing her face and body in a natural standing post with two arms in the front. This version of Sailor Jupiter Anime drawing is more like a fany art in my style as a tribute to the Manga. I like drawing character with different style of Manga drawing rather than the original. Hope you like it. Before I start a drawing, I did rough sketch. I usually start my rough sketch with simple geometry shapes to construct the basic Manga head and body. By following this process, you will find drawing is lot easier. It is very important to get the shape and proportion right in the beginning. If you understand its basic foundation, it will be easier to draw anything. If you want to be good at drawing, you will have to practice at least couple hours a day. Her sailor suit has a dark green collar, dark green skirt, sugar pink front and back bows, dark green boots, a dark green tie around her neck, and a green-stoned tiara. She wears pink rose-shaped earrings and a special hair tie with two green round balls on it. In the manga and PGSM, she wore a rose belt. 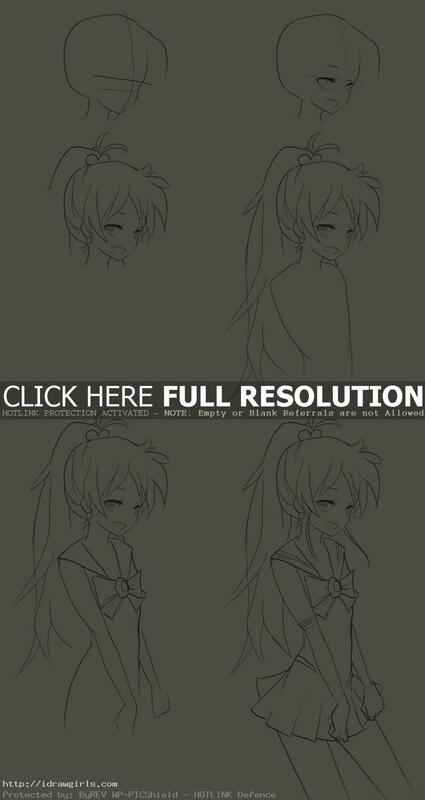 Below are step by step how to draw Sailor Jupiter, Makoto Kino. Step one, I began a sketch with a rough head shape along with two horizontal lines and one vertical line to measure the location of her face. Step two, I drew both eyes inside the paralleled horizontal lines, then nose and lip. Step three, I then added her hair bang in front, whole head of hair, and a root of her pony tail. Step four, I drew her long pony tail and rough sketched her body. Step five, I added her shirt and both arms. Step six, I drew her gloves, mini skirt and legs to finish up.